Despite being the end of October, Melbourne is still only teasing us with the prospect of summer. One tantalizing day of 30 degrees and sunshine, followed by yet another cold, grey rainy day, is certainly testing my patience for winter. Fortunately, like 90% of all Melbourne office workers, I am taking a self-declared ‘Extra Long Weekend’ next weekend in celebration of the Melbourne Cup and will be heading up to the Sunshine Coast for some much needed Vitamin D.
In the meantime, a food that always reminds me of hot, tropical weather is Som Tam (Green Papaya Salad). The Brooding Architect and I learned how to make Som Tam at the Thai Farm Cooking School in Chiang Mai in Northern Thailand. The day started with market tour, followed by a walking tour of the organic farm at the Cooking School (all of the fruit, vegetables and herbs used in the classes are all grown on site) and a full day of cooking. Well worth the $30 (1000 Thai Baht) investment, if you ever happen to find yourself in that part of the world with a free day on your hands. Personally I like to leave the dried shrimp out of my Som Tam recipe, as the instructor at the Cooking School explained that these dried shrimp are full of chock full of chemicals and preservatives – hence their often fluorescent pink colour. If you like to live (deliciously) dangerously though, pound up half a dozen dried shrimp in a mortar and pestle and add this into your salad dressing. To make the dressing, place garlic, snake beans and chillies in a mortar and pestle, pound with the pestle until crushed. Add tomato and pound lightly – you still want some shape and texture. (Alternatively, place all of these ingredients into a food processor or blender and blitz for 1 or 2 minutes). Add lime juice, sugar, fish sauce and salt. Mix until well combined. Toss the dressing and peanuts through the shredded papaya. Garnish the salad with extra peanuts to serve. Serve with steamed rice and grilled chicken or fish as a light summer dinner. Green papaya salad is so refreshing! Also, I never use the pink dried shrimp. There are still good quality ones out there! Leaf: Agreed. 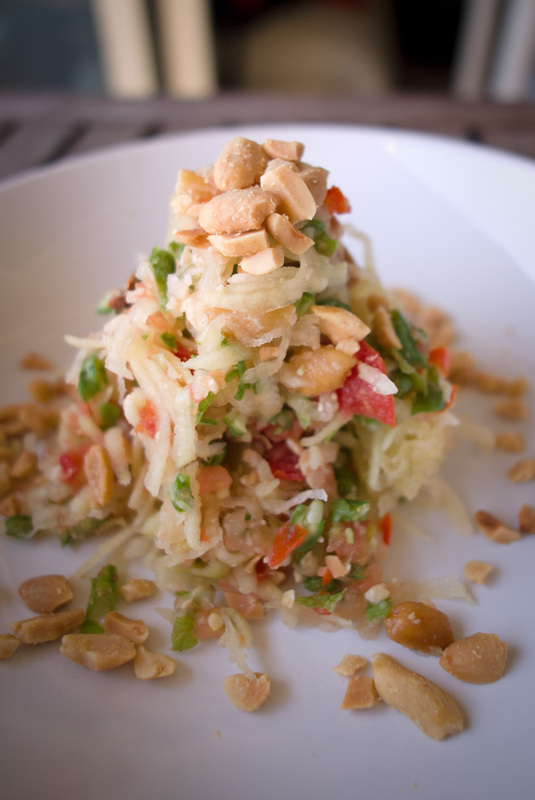 Green papaya salad is very refreshing – particularly on steamy Melbourne day’s like today!